Being me, I decided that I was going to start making bento lunches for my youngest son about a day before school started. So, there I was, fighting the wild moms who were frantically looking for that yellow pronged folder (yeah, you're never gonna find it), and searching for some supplies that I could use to make his lunches before my Amazon bento supplies arrived. Nothing like a plan that isn't well thought out. 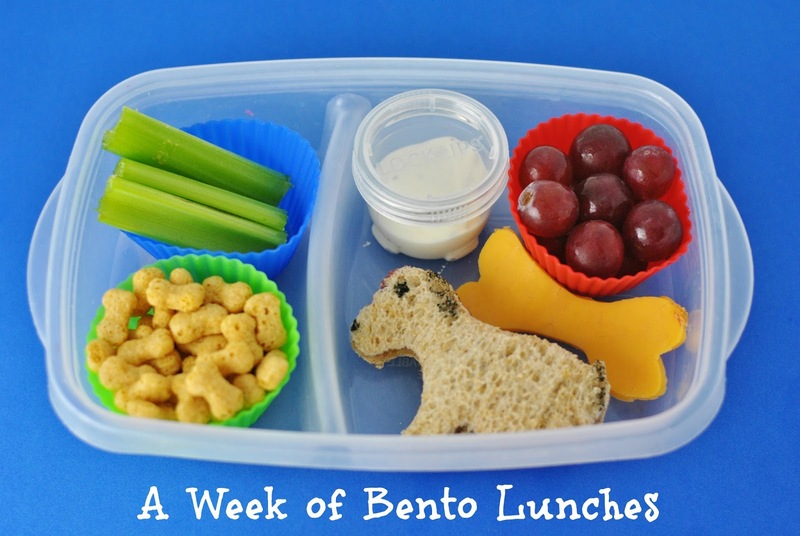 Our first week with bentos wasn't the best, but he got a lunch each day, and they were at least semi creative. I am attempting to have him eat healthier, but vegetables are still bad words around here. I put them in there everyday, but they rarely get finished. It's an ongoing process. Back to School Bento: Peanut butter and jelly sandwich, cherries, Baybel cheese, carrots with ranch dressing and alphabet crackers. I had to make the picks by gluing scrapbook embellishments to regular toothpicks LOL. Dog Gone Good Lunch: Peanut butter and jelly sandwich, bone shaped cheese, Scooby Doo vanilla flavored cereal, grapes and celery with ranch. Far Out Lunch: We had had terriyaki meatballs the night before, so he wanted the left over ones in his lunch. So, terriyaki meatballs, alphabet crackers, star and circle shaped cheese, star shaped cucumbers with ranch and apple slices. Quick tip, soak apple slices in 4 cups cold water and 1 tsp. salt for 3 minutes and they won't turn brown. Say My Name Lunch: Yep, you guessed it, my bento supplies finally came in. My favorite thing? The small alphabet cutters! About eating healthier. I tried, I really did, but we were in the Dollar Tree and he insisted on this can of Vienna sausages, so I bought him one. Vienna sausages on heart picks, round crackers, cheese, multi-shaped cucumbers with ranch and a mango, kiwi and kale fruit mix. Rollin' Into the Weekend Lunch: Turkey and cheese sandwich with Vienna sausage wheels, cherries, Baybel cheese stop sign, carrots and round crackers. Bentos are so adorable! I wish I had time to make some! That back to school bento is just too cute! I want to start bento lunches for my girls. This is a great roundup. These are all such cute ideas! I especially love the paper one for the 1st day of school. I really want to start making these now that my son is in school. Those are SO cute! We don't need to send lunches to school for two more years, but I love bentos & have always wanted to make more for my son, even at home. You should do a post sharing the supplies you bought, I hadn't heard of alphabet cutters &I'm sure there's a lot more I'd need! I just bought some bento boxes today to start making these for my two youngest boys. I really liked all of your ideas. How adorable i love the notebook so creative. What kind of cheese crackers are those? I would love to include them in my son's lunch! OH my goodness those are SO cute! Love the letter crackers! These are all fabulous ideas and I just love the creative themes! I love making bento lunches for my children. I wish I had time to blog about them. Cute lunches. Nope. I'm not very creative nor have the time... but I so admire moms that do this! It's so cute!